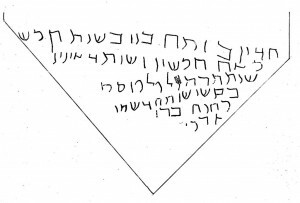 The most important inscription is the dedication in Aramaic of the later synagogue building on three ceiling tiles, Tiles A, B and C, found in the synagogue embankment, as mentioned above. Tile A was broken in three pieces and later joined together; the cracks are visible in the photo. Since reading the tiles is very challenging, Torrey also used infrared photos. The text is painted in black in Tiles A and B. 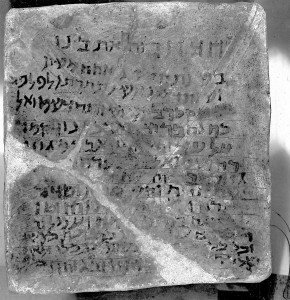 In Tile C, the text is first scrawled and then painted in black in a lower portion of the tile. There is agreement that Tile B with its eight lines is the continuation of the text in Tile A, although J. Oberman1 considered Tile B a separate liturgical text. Tile C was discovered through a fortunate accident. In fact, this tile was painted with a floral decoration that flaked off during transportation revealing the graffito and the painted copy of the beginning of the text in Tile A.
Inscription no. 1a Torrey in Kraeling 1956 = Syr 84. Translation in English (by Torrey in Kraeling 1956, 263-264). Note: In Kraeling’s edition, the English text tries to reproduce the full size of the lacunae in the Aramaic inscription in order to make the missing parts in the lines visible. In the text below, there is only a generic indication of lacuna (…) without any indication of the quantity of the missing letters or sentences, which would be impossible in an English text! As is customary, brackets [ ] are used to integrate a lacuna. 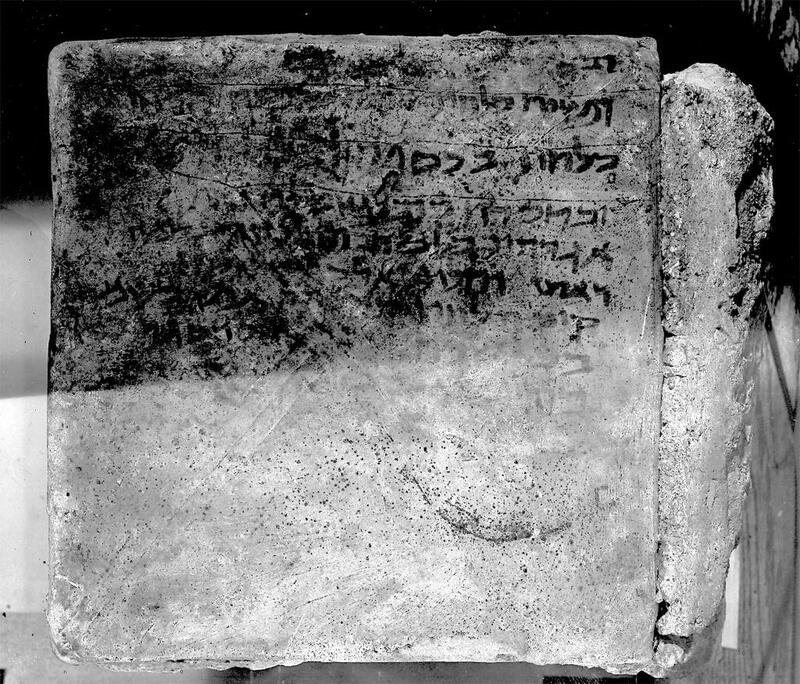 Since the end of the inscription is very damaged, the sentences are incomplete and Torrey offers only possible translations of isolated words. Words in parenthesis ( ) were not in the text, but were added by Torrey. 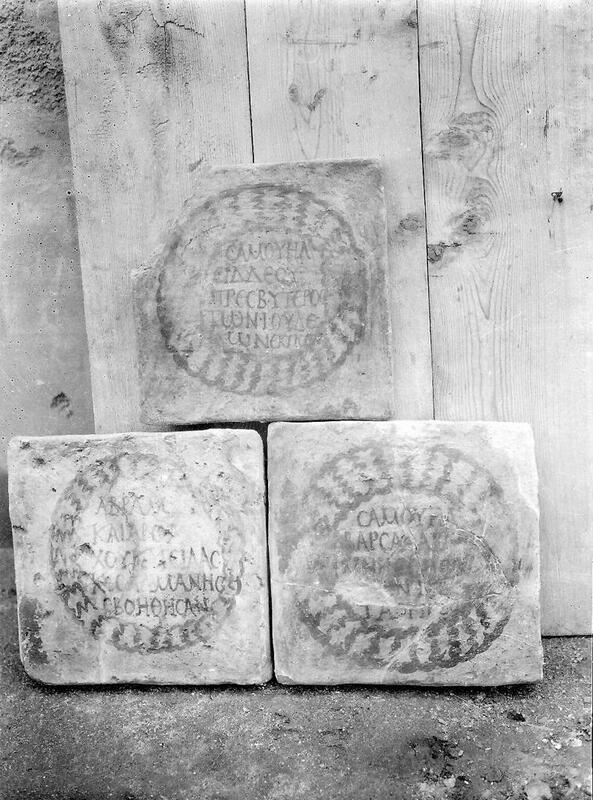 In Tile C, the graffito precedes the dipinto placed in the center. A scheme made by Obermann clarifies the location of the inscriptions.2 With some significant variations, the graffito repeats lines 1-5 of the text in Tile A until the word “archon”; the dipinto repeats lines 1-7 and is suddenly interrupted. The tiles are today in the Yale University Art Gallery. 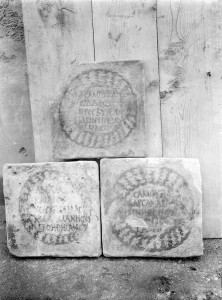 These inscriptions were probably exercises or drafts and today are instrumental as tools to help decipher the texts. 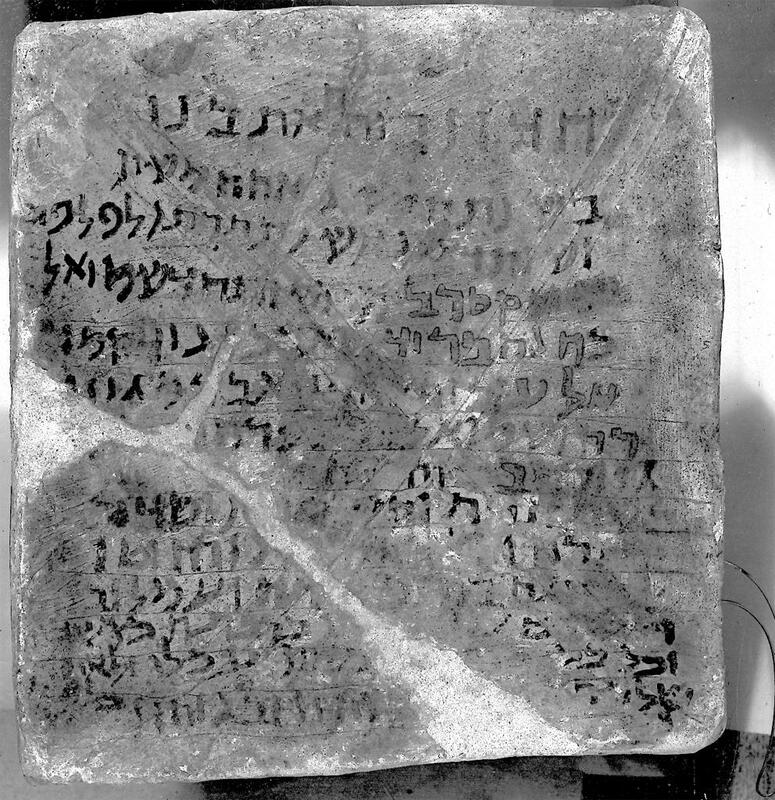 This dedicatory inscription gives a face to some of the unknown people who built, decorated and attended the synagogue. The renovation of the synagogue started in the year 556 of the Seleucid Era, which corresponds to 244 or 245 CE.3 The text also mentions the Roman year: the “Second of Philip [blank] Kaiser,” where Torrey fills in the blank with “Julius.” The blank and the omission of the word “Julius” is interpreted by some scholars as a case of damnatio memoriae. Kraeling believed it to be an erasure since other cases of erasure concerning Philip were known and because of the hostility to Philip in Mesopotamia.4 If this is true, it would have been a strange damnatio, since the words Philip and Kaiser were left there. According to other theories, the incomplete erasure was an error by the person in charge of it5 and/or other natural causes might have damaged the tile. Philip reigned for only three years, and, according to Millar, he replaced Gordianus III in 244 after the latter was killed during his campaign against Shapur. Philip’s short reign was thus very relevant for Dura-Europos, since it marked the beginning of a decade of “Romanization,” when Dura probably gained the status of colonia.6 In this context, the mention of the emperor might express the need of the Jews to be on good terms with the Roman forces. In fact, the Jews had solid relations, established in ancient times, with the Persians, whom the Romans were fighting in continuous campaigns in this period. Line 9 makes another obscure chronological reference: “With a willing spirit they [began to build] in this fifty-sixth year.” The number fifty-six, which recalls the number “556” of the Seleucid Era, might form part of the internal chronology of Dura’s Jewish “community.” The suggestion that this reflects a Jewish chronology of the “destruction of the Second Temple in Jerusalem” (70 CE) has to be rejected since it would result in the year 125/6 CE circa (70+56), which does not match the year 556 of the Seleucid Era. Unfortunately, there is no clear answer to this question. Another chronological reference is mentioned after the Roman chronology: “In the eldership of the priest Samuel son of Yeda’ya, the Archon.” Eldership is in Aramaic קשיש (kashish) and the function is translated in Greek with the word presbyteros, in Hebrew with זקן (Zaken). The fact that Samuel was a priest (כהנה = cahana) does not imply a priori that he had any political responsibilities in the community. Furthermore, there is disagreement among scholars about who was the archon, Samuel or his father Yeda’ya.7 Samuel was the archon according to Torrey’s translation but, for Noy-Bloedhorn, the archon was more likely the father Yeda’ya. The archon’s function as a leader might refer to the Jewish community at large or to the synagogue. The word archon often appears together with the word “archisynagogue” in inscriptions and texts of the first centuries CE within a wide geographical area. “Archisynagogue” could be translated with the Hebrew word Rosh Knesset, ראש כנסת, Head of the congregation. In Acmonia, in Asia Minor, for example, the archon with two archisynagogues undertook the restoration of the building.8 These offices were held by a single person or by two persons, with many geographical variations. At any rate, as Levine (Levine 2000, 402) notes, in small communities there was little distinction between the organizational framework of a community and that of a synagogue. The historical background and geographical context do not provide much help in the identifying the archon in the inscription. New insight might possibly be found in a short Greek inscription in the synagogue, among the three remaining building inscriptions in Greek. 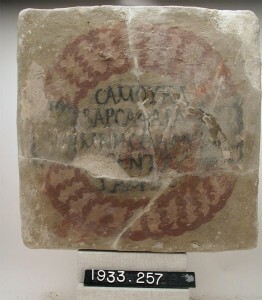 In this inscription, Samuel is called πρεσβύτερος, presbuteros, elder. Inscription no. 23 Welles in Kraeling 1956 = Syr 86. Now in National Museum in Damascus. Transliteration: Samuel Eiddeou presbyteros ton Iudeon ektisen. Together with others, Samuel was in charge of the renovation and probably of the funding for this major project. In the Aramaic inscription, Abram (Abraham in current transliteration) the Treasurer, Samuel son of Saphara, and a proselyte were in charge of the work. These names are also confirmed in the other two remaining Greek inscriptions. Inscription no. 24 Welles in Kraeling 1956 = Syr 87. Now in the Yale University Art Gallery. Transliteration: Samuel Barsaphara mnesthe ektisen tauta outos. 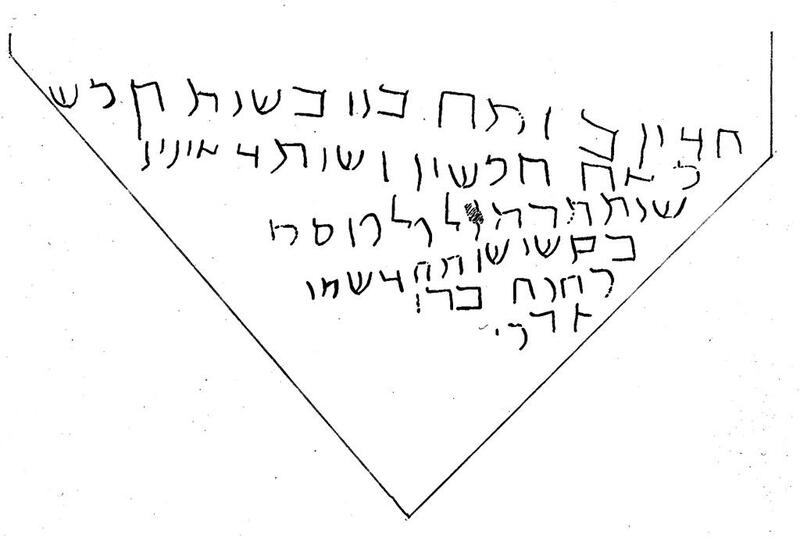 In both inscriptions above (Syr 86-87), Samuel Bar Yeda’ya and Samuel Bar Saphara “build,” ἔκτισεν, the synagogue or “these things,” as in the translation of Noy-Bloedhorn. They had a major role in the renovation, because, as already pointed out in the “History” section, the synagogue complex was not rebuilt from the foundation. 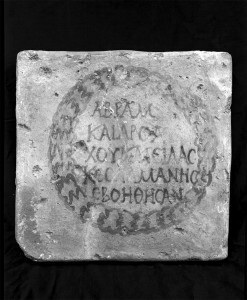 The third inscription mentions Abram (Abraham), Silas and Salmanes, who probably helped with financial contributions. The name Arsaces in the inscription is unclear. Inscription no. 25 Welles in Kraeling 1956 = Syr 88. Now in the National Museum of Damascus. Transliteration: Abram kai Arsachou kai Silas ke Salmanes eboethesan. Abram is the treasurer mentioned in the Aramaic inscription. Silas and Salmanes are unknown. Since Arsaces is in genitive, the text has been the subject of much conjecture. Here, it suffices to say that it is not clear if “Arsachou” is a patronymic of Abram or a mistake of the writer.11 The name Arsaces is Persian. Salmanes is a very common variant of Salomon in the North-Semitic area.